PDC Group 3’s last meeting was about how to incorporate using Google Forms into our lessons for AFL. After some intial hesitation about setting up and using Google Forms, everyone had a go at trialling it. Since our last PDC meeting Stuart has used Google Forms as a starter activity in KS3 lessons and as an exit ticket. He used it as a way of testing students on their knowledge of keywords as well as identifying key tools they need to use of the software they have been using. He intends to develop this further by incorporating it further into concepts books a technique we have looked at in our recent PDC meeting. Julia has used Google Forms as formative assessment in teaching fractions of amounts. 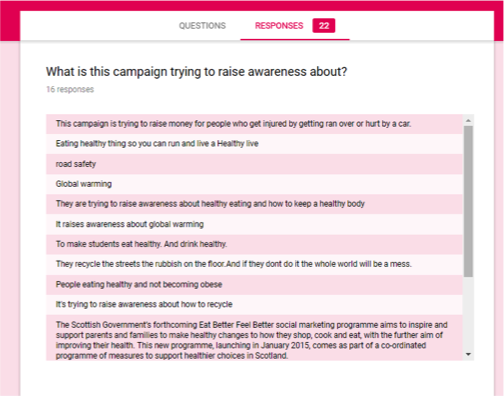 She used this to check the understanding of pupils before moving on to the next teaching point, in doing so she was able to check that all pupils had an understanding of the topic using the multiple choice options to offer solutions that result from misconceptions. This meant that she knew everyone had the essential knowledge to continue their learning. Faizal has used Google Forms with his year 7 science group since our last PDC meeting. The form was used as an exit ticket. It enabled him to identify the knowledge students acquired during that lesson and also enabled him to identify gaps or any misunderstandings in knowledge if the responses were incorrect. With Google Forms he was also able to quiz students on what they would like to learn more about or like to recap, this helped to tailor future lessons to the needs of his class and personalise the learning. Rob tried a few new teaching techniques with his year 12s since our last meeting, He was keen to know how they thought they’d learnt best since September. 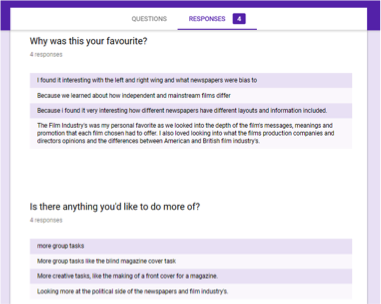 Using Google Forms, he surveyed the class and was able to see what they had enjoyed, how they’d learnt best and what they’d like to do more of.